In one of the most read posts on my blog—the last one I wrote before being drafted by Hardball Times—I analyzed the correlation between the location of pitches and the trajectory of the resulting batted balls. I won’t go into details, as you can read them in that post, but I will summarize a couple of things that will be useful in this article. The correlation between pitch location and hit direction varied, in 2008, between the values 0.00 (obtained by Brad Hawpe) and 0.42 (recorded by Doug Mientkiewicz). As I wrote before, nobody in the majors has a negative value; players who hit inside pitches to the opposite field while pulling outside pitches, if they exist at all, don’t make to the bigs. In my blog I went on to quantify the value of hitting the ball according to the pitch location. Here I will take a different path to see if this kind of analysis can produce useful information for players on the field. 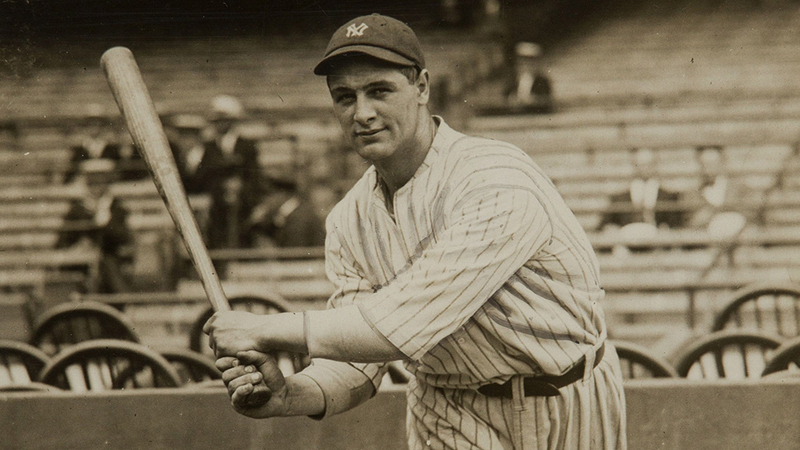 When I play second base for my amateur team, I cheat on my positioning: I look at where the catcher puts the target and – when the pitcher starts his motion and the hitter can’t look anywhere else than at the ball I move slightly to one side or the other. I feel that on days when my pitchers are hitting their spots I cover more ground. Justin Morneau has one of the highest values in my hit-em-where-they’re-pitched ranking (0.41). That means he places balls on the inside corner more toward right field than balls on the outside corner. You can see how the trajectory for inside pitches has a slightly different distribution than the trajectory for outside pitches. 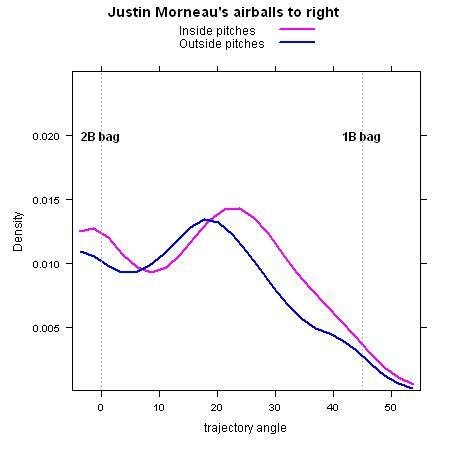 While it might not be a big deal, I think that, having this information on Morneau, I would take half a step to my left (toward the right field line) after my catcher has called for an inside pitch. In the next chart I will look at air balls (fly balls and liners). I will stay on the right side again and present the positioning options for the right fielder. Again, leaning to one side or the other (depending on the expected pitch) won’t hurt. Let’s take another very good hitter who has a low correlation in my metric (0.06) instead. Alex Rodriguez is our man. Since I looked at the right side for a left-handed batter, I’ll look at the left side for this right-handed batter. 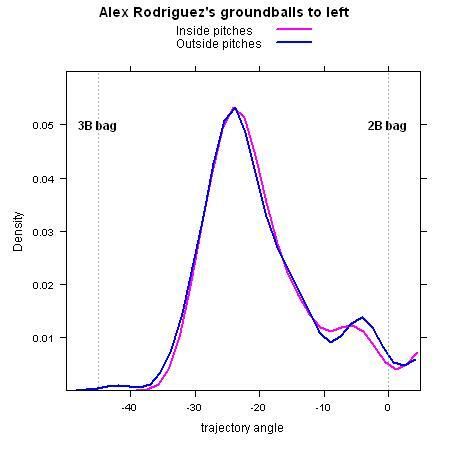 Here are the trajectories of A-Rod ground balls between the second and the third base bags. The lines for inside and outside pitches overlap a lot, so there’s no need for a shortstop to lean to either side depending on his battery’s pitch selection. And, finally, A-Rod’s air balls to left field. Here there is some difference, similar to what we have seen for Morneau. This can be an indication that not all the glove men on the field should behave the same way when the catcher puts down his signs. After a couple of articles, some eaders might be thinking that in my previous life I was Edwin A. Abbott. I promise that, sooner or later, I’ll start exploring the other dimensions of the pitch locations. All data from 2008 MLBAM Gameday. On the x axis you see the hit trajectory angle: it goes from -45° (ball hit down the left field line) to 45° (ball hit down the right field line); a ball up the middle will have an angle of 0°. On the y axis you see the density of batted balls. You can look at it this way: split the hits into ten bins according to the trajectory angle and plot a histogram with the pecentages for each bin on the y axis; repeat the procedure, but split in twenty bins instead; then suppose you can split the hits in an infinite number of bins – you have the density line you see in the charts I showed. 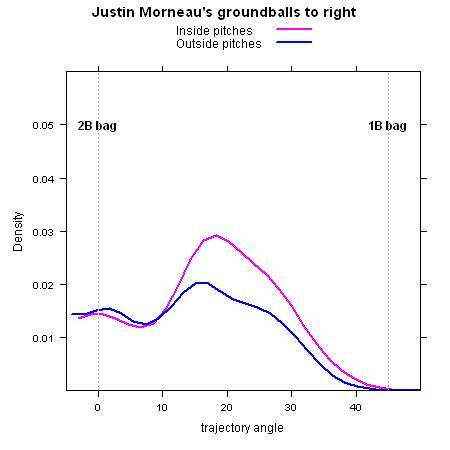 Below you can see an example on every groundball hit by Morneau on inside pitches. OK, this was really quick and dirty. Here you can find a brief introduction to density estimation – something the casual reader can easily grasp, and real statisticians won’t be horriefied at.